Welcome to the Pelkhil School page! MOE has finally issued the list of students being placed in private schools. Please visit our Facebook page to look up your names. Please note however, that you are free to select the school of your choice. Please note that we have seats in the Science stream for both Class XI and XII with the best faculty. Please call to enquire. 17625335. ADMISSIONS 2019: Admissions are being processed daily on all working days. Admission forms are available at the School Office. Applicants are requested to bring a copy of the marks sheets and their Transfer Certificate. You can call 77220349 / 17625335. We offer seats from PP-VI, VIII, X, XI and XII. We offer Science, Commerce and Arts streams in grades XI and XII. Due to demand we are opening another section of PP and have a few spare seats. Please apply early if you are still looking for seats! We encourage students to join our exceptional Primary Wing to get the best out of the early learning years! 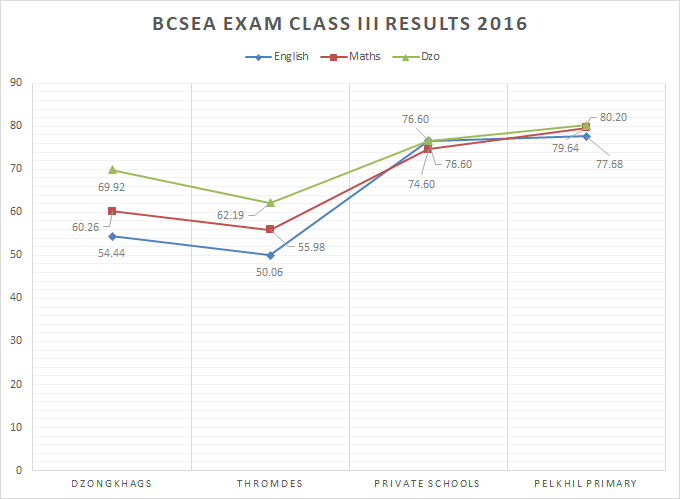 The graph above illustrates how much our Primary Wing stands out among all categories of schools in Bhutan! Please browse this page for more information about the school. For regular updates on school events please visit our facebook page! You can direct other queries to the contact information provided above.